Discussion in 'iPhone' started by Chatter, Sep 16, 2014. Saw this floating around and thought I would share it. Its in response to the "my Nexus had this 2 years ago" images floating around. Obviously I credit whoever put this together - but I dont know who they are. I know I know - it is stupid and childish. But its kinda funny! Please, share, I'm dying to see what is so funny. 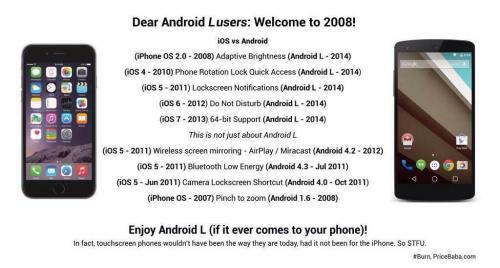 So Apple is beating today's Android with 2008 specs lol. I would like to dedicate this post to all the android users out there. Shows that specs are nothing. Functionality is everything. People who think specs are so important don't have a clue about how to develop a product. The Samsung one looks more like a kick in the teeth. No worries, lookin' forward to the 6+ anyhoo. I don't know what benchmarks would show, but I have a 2009 MacBook Pro that seems to perform better than a 2013 Intel i5 VAIO. It's frustrating. You just don't get everything out of the specs if the various components and software are not optimized to work well together. Fair enough, but what are you looking forward to in the 6 plus? Isn't that one of the biggest bullet points Android fans site? I would very much say Android showed Apple this form factor was profitable as much as Apple showed others how tablets (and smartphones as we know them) are profitable. Apologies all. I thought I had posted the image. My bad. Thank you for posting it anyways. Guess I was laughing too hard??? Yeah Android really nailed the phone/phablet form factor. They were years ahead. Credit where credit's due. I nearly even went over to Samsung this time, but Apple came through in the end. About tablets - I'm still not convinced. iPads without 3rd party developers would be a pretty weak product as it handles files poorly. Sales are slumping. People going to phablets. We'll see where it all ends up, but I'm having third thoughts about the tablet market. Apple definitely shook it all up for sure though. Not that I am an Android fan, because I am not embedded in or beholden to either iOS or android, I use both as I please, but this comparison is actually pretty inaccurate other than the 64 bit support in Android L. The other iphone vs nexus one is actually much more accurate. Sorry, but it is true. But it was a nice try. All in fun. Lol you people do realize that android has had every single one of those features for YEARS except 64bit? Perhaps through an app or a manufacturer specific version of android, but literally the only new thing on that list is 64 bit. Lol, pretty much just what I said post above yours. These "new android features" have been around for a long time. Not necesarily baked into the OS as you mention, but definitely there and with many different forms of implementation for the end user to check out and find one they like. Another entry into one of the most pointless arguments going. Android is a quality OS and puts out a solid product and so does Apple. Both are going to have their fans, loyalists, and apologists. Let's just let that be and talk amongst yourselves rather than bicker about nonsense. Thought of that, but really can't include jailbreak because it is totally different. I am comparing stock Android and stock iOS. If you wanna thrown in jailbreak, then you gotta throw in root and custom ROMS for android. Stock android let's you change up and add all that stuff that they are mentioning on this graphic out of the box. Jailbreak you have to wait on, sometimes for months like with the iphone5/5s. Then you can add tweaks. It is a whole cat and mouse game. Nice try though man. Haha. And again, I am both an android fan and Apple fan. I like and use both depending on what I want to do. I am just trying to point out what is true is true, and what is not is not, and this little comparison is not even close to being correct. well you said "not necessarily baked into the OS" which discludes stock Android. That's okay. We're busy arguing over whether the 6 or 6 Plus is the better iPhone. From the clarity, looks like that image is from 1998.